We live in a digital world enjoying convenient and limitless access to people, information, and the Internet of Things. What could be the downside? EMF for one. What is EMF? EMF stands for “Electromagnetic Fields.” Electromagnetic fields encompass an entire spectrum of waves from extremely low frequencies (ELF) and visible light to ultra-high frequencies, such as cosmic rays (ionizing radiation). What I refer to as “EMF” is the non-ionizing radiation to which we are exposed from cell phones and cell-phone towers, Wi-Fi, cellular data, Bluetooth, smart meters, computers, solar panel inverters, AC-to-DC transformers, power lines, and signals from other digital devices. Is EMF harmful? Yes, there is a large body of scientific evidence showing EMF can be extremely harmful. Plenty of evidence has existed for decades. Do a search on PubMed. The harms of EMF are not publicized to consumers, especially by companies profiting from the digital and wireless revolutions. The problem: every year there are more cell phone towers, Wi-Fi networks, “Smart” meters, and solar panel inverters. Soon California will mandate all new homes must have solar power, which means more EMF. Beyond this, there are millions of 5G antennas coming to your region, as part of the most powerful wireless network ever built. Most health care professionals don’t know much about EMF and the importance of reducing exposure. However, there are a growing number of physicians who understand the dangers of EMF. They can make suggestions for lowering EMF exposure and may also refer you to EMF mitigation experts. There are four types of EMF building biologists generally test for in homes: 1) Radiofrequency fields (RF), 2) magnetic fields, 3) electric fields, and 4) electromagnetic interference (EMI) or “dirty electricity.” All four types can cause health issues, so it is important to measure and isolate them so you can take action to reduce each type of field, respectively. I tested my house and office for all four types of EMF—and found all four of them at high levels. I have since mitigated them to safer levels. I continue to find ways to reduce EMF and my exposures to them. • DNA Damage – Radiofrequency (RF) radiation induces both single- and double-stranded DNA breaks in human and animal cells. When DNA breaks are not properly repaired, the long-term damage results in adverse health effects. • Voltage Gated Calcium Channels (VGCC) – EMF opens VGCCs causing cells to be flooded with calcium. This excess calcium disrupts multiple pathways, leading to various negative effects, including increased oxidative stress, disrupted nerve cell communication, and heart-related problems. • Blood Brain Barrier – EMF can open the blood-brain barrier causing toxins or other harmful substances to enter the brain, and for the brain to leak” substances it requires, such as nutrients or neurotransmitters. • Melatonin Hormone Reduction – EMF suppresses the production of melatonin, which is the antioxidant hormone responsible for repairing the body during sleep. When the body does not properly repair itself at night, problems can arise from immune-related conditions to premature aging. • Microbiome Disruption – Just as all cells—including those in our body, are electrical, the organisms in our microbiome are electrical, too. There is evidence to show that our microbiome is harmed by EMF. These are some of the ways that EMF can harm health. When you add them together, you begin to get a picture showing that EMF can cause significant harm to biological systems. Many scientists have suggested how EMF can contribute to almost any health condition from autism to Alzheimer’s disease. Certain people, myself included, can immediately feel the effects of EMF exposure. Immediate or short-term effects can vary from fatigue, low-energy, and mental fogginess to head and body pains, and ringing in the ears (tinnitus). Terms used to describe the state of being sensitive to EMF are “Electromagnetic Sensitivity” and “Electromagnetic Hypersensitivity” (EHS). Persons who suffer from EHS may range from 2% to 7% of the population or higher. Yet, whether or not you are “EHS” or feel effects from EMF exposure, science shows your body remains subject to adverse effects, including oxidative damage. That is, just because you do not feel it, does not mean it is not harmful. Note: there is evidence that certain frequencies of EMF can support health. These often fall into the category of PEMF or “pulsed electromagnetic fields.” Another example: the Schumann resonances (7.82 Hz – 33.8 Hz), which are natural electromagnetic resonances created by lightning discharges from the ionosphere and the surface of the earth. The Schumann resonances are natural earth frequencies to which humans and all life has been exposed for millions of years. In my case, I never really noticed any problems until I had a solar panel power system installed on my roof-—on two different homes, one in 2014 and the other in 2017. In both cases, I was exposed for relatively long periods at short distances to smart meters and solar inverters, as well as solar-related Wi-Fi equipment. Shortly after the first installation, I noticed fatigue, inability to concentrate, and pressure in my head. I did not initially make the connection between how I was feeling and the solar installation, which included a DC to AC inverter and two smart meters. I tried to keep my analog electric meter, but the solar company told me only digital smart meters are compatible with the solar power system. My symptoms improved when I moved my desk away from the wall on whose opposite side the solar equipment was located. Shortly thereafter, we moved to a different home in our metropolitan area. A few years later, we had solar panels installed on our new house. I hoped to avoid symptoms similar to what I had experience previously. No such luck. After the second solar installation in 2017, I again experienced fatigue, inability to concentrate, as well as pain in my head. I moved my desk and unplugged the solar company’s dedicated Wi-Fi unit that measures solar power generation. I felt better. But over a period of months I developed increasing low-tone tinnitus (ringing in the ears). At first it sounded like a small plane or a truck engine in the distance. The noise grew louder. Then it rumbled night and day. I realized it wasn’t an engine when I discovered the noise was significantly louder in my right ear. Alarmed, I began the process of eliminating possible causes. I finally eliminated all causes—except for EMF. I read every book I could find about EMF. I read dozens of books, watched videos on the topic, and spoke to EMF experts. During this period my son chose to research EMF for science fair project. His initial idea was to build something for me (like a tinfoil helmet) to reduce my exposure. That idea evolved into measuring the EMF levels emitted by all electronics in our house. My son’s science project would go on to regionals in our state. Yet for me, the most important thing was how it contributed to our understanding of EMF. It was a launch pad driving us deeper into research, and led to the implementation of many EMF mitigation strategies. Our entire family benefited from it. 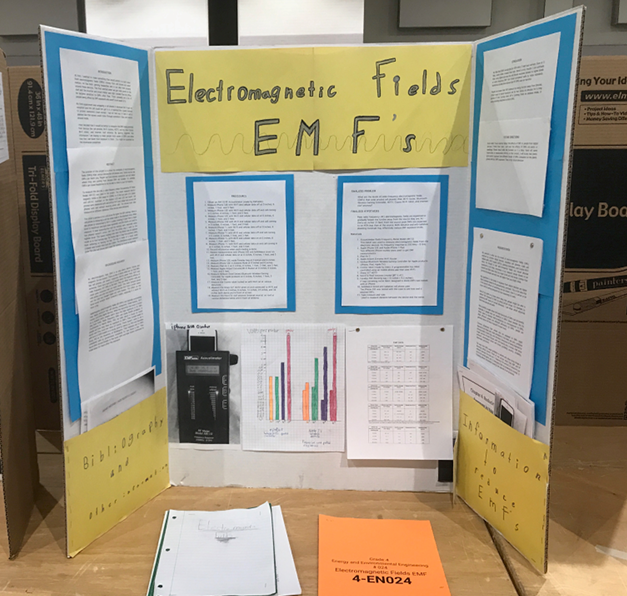 My son’s 4th-grade science fair project on EMF at Southern Arizona regionals. Olin in front of his project board. It took months, but what we learned helped us take actions to mitigate EMF exposure. My tinnitus began fading and then diminished significantly so that it is not a daily issue for me. This was empowering for me because I took positive actions that made a difference in my health. The process continues because EMF is not going away. I remain vigilant. Yet, I hope my experience can help you reduce your EMF exposure, or avoid developing EMF sensitivity. I still use cell phones and other digital devices. But I use them less and in much smarter ways. Ways that reduce my EMF exposure. Due to my research and experience with EMF, my awareness of its dangers is such that my thinking on the topic is forever changed. I can never take EMF safety for granted. That is a good thing. EMF FROM SMART METERS, CELL PHONES, SOLAR INVERTERS, ETC. Smart meters and DC-to-AC solar inverters can produce high levels of electromagnetic interference (EMI), which is one form of EMF. For more information on EMI, read Samuel Milham’s Dirty Electricity (see resources section below). After reading that book, I considered the possibility that EMI could be contributing to my problems with EMF. I learned that any device (like an inverter) that converts DC power (say from solar panels) into AC power (home outlets) can add unwanted forms of electricity into the AC power. Clean (60 Hz) electricity becomes polluted by electromagnetic interference. The higher the levels of this EMI or “dirty” electricity, the greater the amount of health effects. I obtained a broadband EMI meter from Greenwave to measure dirty electricity in my home. I measured EMI levels with the solar system running at midday. Recommended EMI levels are 25–50 millivolts. Yet, every outlet in the house measured almost 2,000 millivolts (1,986 millivolts to be precise!). I shut off the solar inverter (disabling it and two smart meters) to measure baseline dirty electricity. EMI levels dropped to less than 200 millivolts! This meant one thing: components of our solar system causing high levels (1700+ millivolts) of dirty electricity. Greenwave meter measures dirty electricity in home electrical systems. My first solution was to purchase multiple plug-in Greenwave EMI filters. I installed them in about 25 outlets throughout my home. They reduced EMI significantly, but they did not reduce it much in the outlets nearest to area that houses the breaker box, solar inverter, and smart meters. A few outlets away from that area exhibited stubbornly high EMI (1,500+ millivolts). After further research, I called Satic USA. Satic is a solar company that understands that EMI can affect people. They have products designed to condition an electrical system to remove dirty electricity. I purchased a line conditioner (Super Duty Power Perfect Box) from Satic specifically created to clean EMI from photovoltaic (PV) solar systems. Note: Satic describes its line conditioners primarily as energy saving devices and protectors of electrical equipment. Clean power is more efficient. Yet, clean, conditioned AC power means reduced EMI. Thus, there is a human health component built-in, if you will. 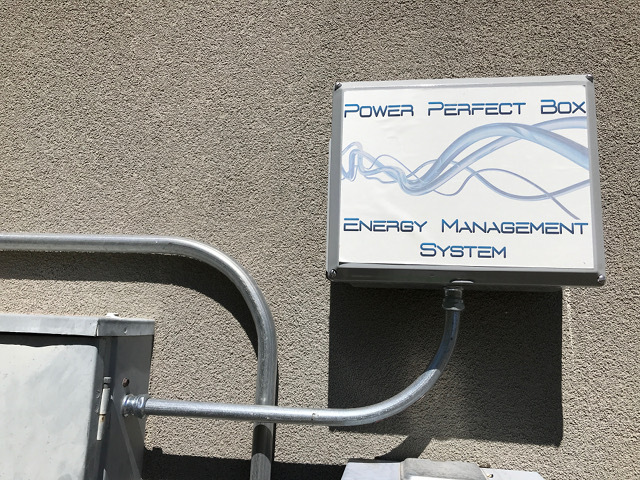 The Power Perfect Box was installed by an electrician near our breaker box. This line conditioner (containing two harmonic rectifiers) removed many unwanted harmonics and transients induced into our homes’ electrical system by the solar inverter and smart meters. Above all, I felt better. I could focus better. I slept better. So did everyone else in the house. And my tinnitus began to diminish. Satic USA’s “Power Perfect Box” is a line conditioner that directly connects to the breaker box where it “cleans” your AC power using two harmonic rectifiers. I highly recommend obtaining a Power Perfect Box if you have a smart meter, solar power inverter, or dirty electricity (EMI) coming from your utility. 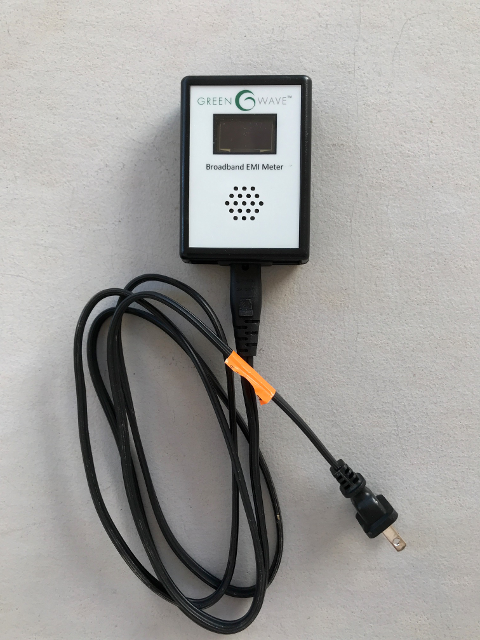 Measure baseline dirty electricity in AC outlets using a broadband EMI meter (like Greenwave) after turning off your solar inverter and and smart meters. Satic makes several types of Power Perfect Box. Which one you need depends on how many harmonic rectifiers your electrical system requires. They also make smaller, lower-cost in-line and plug-in EMF Eliminator devices, which act as high-capacity EMI filters. These provide less protection than a Power Perfect Box, but more than a Greenwave filter. Satic will recommend products based on your unique needs. If you contact Satic to order, speak to Alden, mention my name, and he may offer you a discount. At Satic’s recommendation, I kept the plug-in Greenwave filters in power outlets throughout my home. Between the line conditioner and the Greenwave filters, EMI now ranges from 15 millivolts to 300 millivolts in most outlets during the day. It is lowest (10–50 millivolts) at night when the solar system is not running. 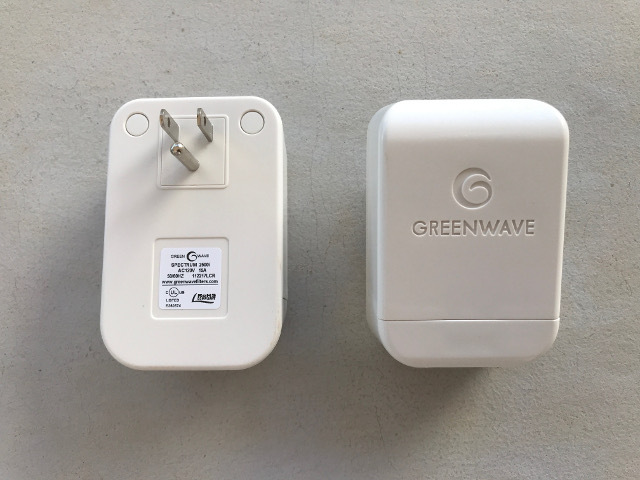 Note: Many homes only require Greenwave plug-in filters because EMI (dirty electricity) levels are already low to moderate (100-300 millivolts), as measured by a Greenwave meter. However, a residence or office with a typical solar panel installation peaks at about 2,000 millivolts. Thus, a solar-powered home, office, or school may require a dedicated line conditioner to reduce EMI below reductions obtained by plug-in filters. Multiple Greenwave filters plugged into AC outlets can further reduce EMI. The combination of a line conditioner (like Satic USA’s Power Perfect Box) and plug-in Greenwave filters works well to bring EMI down to safer levels. Greenwave EMI filters plug into household outlets to reduce dirty electricity. Another EMF issue arose. It seems my exposure to EMF from the home solar system prior to mitigation had led to a general sensitivity to EMF from other sources. That is, even though I had reduced my exposure to fields relating to the solar panel system and its parts (smart meters, solar inverter, solar-related Wi-Fi equipment), I had nevertheless become more sensitive to EMF from cell phones, cellular phone data, Wi-Fi, Bluetooth, vehicle electronics, and other sources. This sensitivity meant that mitigating dirty electricity (EMI) and reducing the tinnitus, while helpful, would not be sufficient to stop my suffering related to other EMF sources. It would take effort to identify the sources, and then remove or mitigate them. Meters are your best friend when it comes to measuring EMF. About the same time I found the Greenwave EMI meter—EMI is just one type of EMF—I obtained three or four meters designed to measure other types of electromagnetic fields. 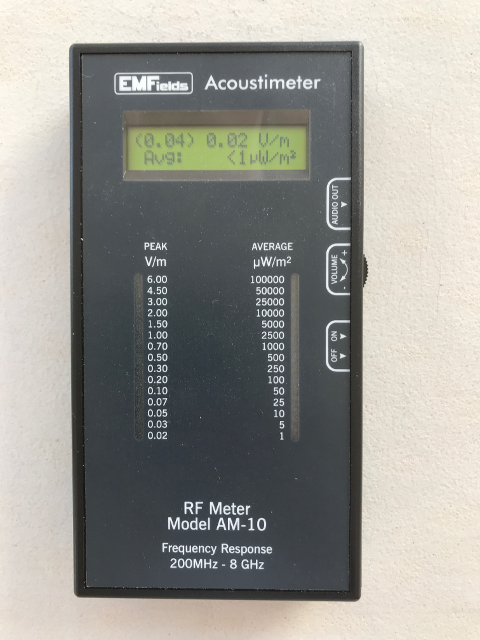 EMFields AM-10 Acoustimeter is versatile and easy to use. I began the process of measuring every type of device from iPads to cell phone chargers. I carried meters with me everywhere I went. 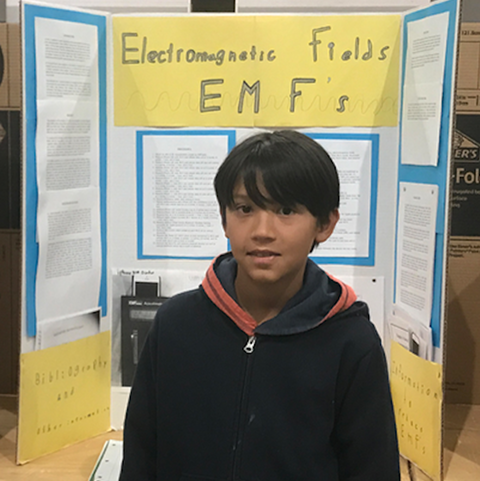 During his science fair project, I helped my son measure and document readings from EMF sources at multiple distances. This data would be invaluable for my own mitigation efforts. Overall, EMF levels were far greater than I expected, and from a wider variety of sources not just mobile phones or Wi-Fi routers. For example, wireless toys and cordless phones can be among the worst offenders in the RF frequencies. Even indoor hydroponic systems can generate high levels of dirty electricity. 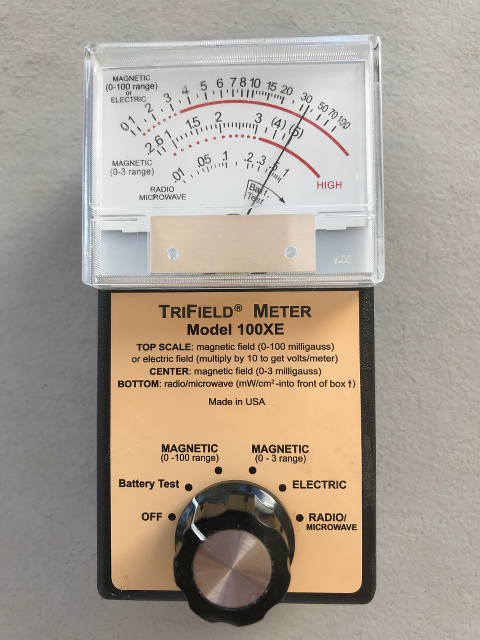 The TriField Meter 100XE is cost-effective. Using my meters to obtain accurate measurements, I began reducing my exposure to all sources of EMF. The more I reduced EMF exposures, the better I felt. I noticed—and continue to notice—improvements in focus, mental energy, and overall well being. If my EMF problems are a challenge to solve, then at least there are some upsides. My research has led me to solutions that allow me to heal and avoid symptoms. I am empowered to act upon my knowledge, and to share it. In many ways, my experience has been a blessing. I am now aware of EMF dangers. While I would not wish anyone to have my experience, I hope that sharing my experience can help even a few people to avoid adverse health effects of EMF. Here are some actions you can take that have helped me. I recommend you take these actions whether or not you feel symptoms or believe you are not affected by EMF. • Create a wired Internet network in the home. Computers, laptops, and HDTVs can run on hardwired Ethernet connections. Smart phones and tablets can be hardwired using Ethernet adaptor cords. Use Wi-fi routers infrequently (minimize use), or not at all. Keep routers as far away from living areas as possible. • Keep smart phones in airplane mode whenever possible. Minimize use of cell phones for calls. Use Air tube headsets and speaker phones whenever possible to provide distance from the device. • Use an anti-radiation mobile phone case (like SafeSleeve). Avoid using mobile phones in a vehicles like cars and buses (as vehicles act as Faraday cages in which signals just bounce around). Keep away from phone or tablet when downloading data. Turn off Wi-Fi and cellular data on the phone most of the time. • Never keep mobile phones in pockets or close to the body. Turn phone off or use airplane mode if phone must be kept in proximity to the body. • Turn off electronics (phones, routers, Bluetooth devices) at night. Keep cell phones and other electronics out of your bedroom. Put your router on timer switch to shut off automatically at 9 or 10 pm. • Use a landline phone. Yes, landline phone service still exists in most places. • Obtain a good general EMF meter or two, such as a Trifield, Acoustimer, Cornet, or ME3030B (Gigahertz Solutions). Test your house and your devices. • Test for electromagnetic interference (EMI) in household outlets using a EMI meter. Install a line conditioner and/or EMI filters (to reduce “dirty electricity”). You can obtain EMI meters and filters from Greenwave or Stetzer. • Shield smart meters using “radiant barrier” anti-radiation materials, like Satic Shield (from Satic USA) or Reflectix (available at Home Depot). Place shielding on the interior wall opposite the meter. There are also metal meter cages for blocking fields coming from the face and sides of smart meter. • Consider an in-line conditioner for your electrical system, especially if you have a smart meter or solar panels—or measure significant amounts (300+ millivolts) of dirty electricity on your wiring. I am pleased with Satic USA’s line conditioner (Power Perfect Box) that attaches to my electrical breaker box. If you contact Satic to order a line conditioner, ask to speak to Alden. Mention my name, and he may give you a discount. • Keep a Faraday bag available for times when you want to block all signals to or from your smart phone or other devices. They are available for less than $20. The more simple actions I take to reduce EMF, the better I feel. The list of actions I take to reduce EMF exposure grows weekly, it seems. Most of my symptoms have gone away. However, I have no desire to risk them coming back. Whenever possible, I avoid other people using cell phones, reduce time spent in places with Wi-Fi routers, smart meters, cell phone towers, etc. I have become more sensitive than some of my meters (at least sometimes), so I feel that I am nearly a kind of meter myself in terms detecting the presence and magnitude of electromagnetic fields. Even so, I am often surprised by high EMF readings using my meters. Takeaway: Relying solely on yourself (no matter how sensitive you think you are), is not the best idea. The most important thing you can do is to obtain a good EMF meter. Measure around your house, your devices, and appliances. Unless you actually have a meter, you will not likely optimize EMF reduction—because you can’t see EMFs. If cost is an issue, certain online stores let you rent EMF meters. Get started today! The first lines of defense against EMF should be increasing distance from EMF sources, and reducing duration of exposure. These make a huge difference for protecting health. One cannot control all sources of exposure. Neighbors have routers, smart meters, antennas, and other sources of EMF generating electronic pollution (“electrosmog”). Wi-Fi is nearly everywhere these days. A huge component in EMF defense is nutritional supplements. Why? Because levels of EMF to which we are commonly exposed result in oxidative stress requiring high levels of antioxidants to quench free radicals. Fortunately, HPDI produces some of the best nutritional supplements available for dealing with EMF. I already had a good diet and took plenty of high-quality nutritional supplements when my problems with EMF started. What I began doing differently was 1) taking generally higher doses of antioxidants and 2) targeting my antioxidant defense systems with specific antioxidant supplements. By focusing on meeting my higher needs for antioxidants, and by adding specific supplements known for their antioxidant capabilities, I believe I mitigate the worst adverse effects of EMF. Antioxidant supplements noticeably support my ability to function as normally as possible given both my past experiences with EMF, and the ongoing daily needs for antioxidant defense. I will describe the supplements I believe are most important to take for EMF exposure. I take all these supplements. I include every one of these supplements because each offers a unique benefit. Together they are the most essential formulas to help both with routine, daily exposures to EMF (like Wi-Fi and cell phones), as well as other types of exposures, such as proximity to potent EMF sources from smart meters to cell phone towers. The primary type of damage caused by EMF is oxidative stress, the most important type of nutritional supplements to help with free-radical damage are antioxidant formulas, including vitamin C and Nrf2 activator supplements. 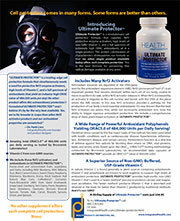 HPDI offers a complete range of antioxidant and Nrf2 activator products. PRO-C™ is an advanced free-radical protection formula. It performs double-duty as both a potent vitamin C formula and an superb antioxidant formula. It therefore provides important benefits when used in applications requiring Vitamin C and/or free-radical defense, e.g., protocols for general health, anti-aging, rejuvenation, etc. PRO-C™ contains 500 mg (833% RDA) of buffered non-GMO Vitamin C (in the form of powdered calcium, magnesium, and zinc ascorbates), as well as high-potency Grape Extract (from grape seeds, skins, and pulp), green tea extract, reduced glutathione, n-acetyl-l-cysteine (NAC), r-lipoic acid, coenzyme forms of Vitamin B2 and Vitamin B6, and selenium. Many of these ingredients are powerful Nrf2 activators. HIGHLY EFFECTIVE VITAMIN C FORMULA PLUS ANTIOXIDANTS. A Complete Vitamin C Formula and a Powerful Antioxidant Formula Combined in a Single Supplement! SYNERGISTIC FREE-RADICAL QUENCHING FORMULA. 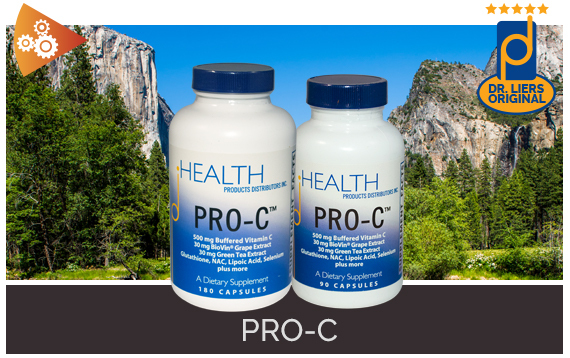 PRO-C Components Work Together To Quench Free Radicals in Your Body. Vitamin C Enables Grape Extract to Function More Effectively, and Conversely Grape Extract Potentiates Vitamin C. Green Tea Extract Boosts ORAC (Oxygen Radical Absorbance Capacity) Value. Read More Below. POWERFUL, NRF2 ACTIVATOR. PRO-C Components of Grape Extract, Green Tea Extract, R-Lipoic Acid, and NAC are all well known Nrf2 activators. These Nrf2 activators are able to stimulate the body’s endogenous production of enzymes such as superoxidedismutase, glutathione peroxidase, catalase, and hemeoxygenase. SUPERIOR, BUFFERED (NON-ACIDIC) FORM OF VITAMIN C. Mineral Ascorbates Never Acidify Your Body, Keeping You pH Balanced. Staying Alkaline Is An Important Element in Maintaining a Healthy Body. RAPID ASSIMILATION. Vegetarian Capsule Form Ensures Rapid Uptake and Assimilation in the Body. You May Also Empty Capsule Contents into Water, Food, or Directly Into Your Mouth, If Desired. Mildly Tart Taste! If I were to take just one antioxidant/vitamn C formula, PRO-C™ would be it. However, I also take another antioxidant formula called Ultimate Protector. I believe the combination of the two superb formulas works even better for EMF exposure. That’s partly because Ultimate Protector activates Nrf2 in cells allowing them to generate their own antioxidants. ULTIMATE PROTECTOR™ is a next-generation cell protection formula providing Nrf2 protective enzyme activators, high levels of non-GMO Vitamin C, and a full spectrum of exceptionally high potency antioxidants (with an ORAC5.0™ value of 486,000 (per six capsules). ULTIMATE PROTECTOR supplies nutrients that provide anti-aging, anti-inflammatory, and pain relieving effects, as well as ultra-high levels of antioxidant protection. Damage to cells caused by free-radicals contributes to many degenerative health conditions and to the aging process. This formula effectively supports the body in combating adverse effects of free-radicals. Acts to support the body in the prevention of cardiovascular conditions, hypertension, and support strong immunity. Ultra powerful free radical defense. Helps prevent and mitigate free radical damage that contributes to conditions of poor health. Ultra-High Antioxidant Potency with an ORAC5.0™ of 486,000 (per six capsules)! Complete Formula Defends Body Against All Five Major Classes of Free Radicals. Provides 30+ Fruit- and Vegetable-Based Antioxidants and Nrf2 Activators to Offer Full Spectrum Protection. 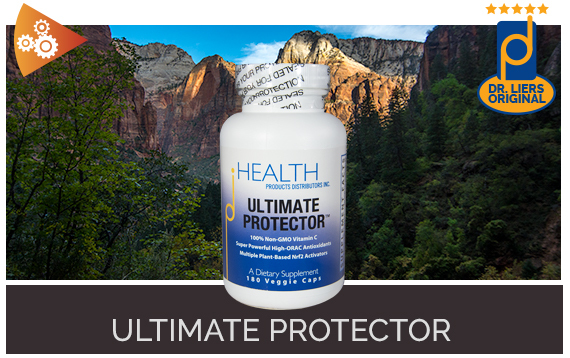 ULTIMATE PROTECTOR™ contains USP-grade non-GMO Vitamin C, AnthoComplete™ (high-ORAC powder: 3000 units/g from Wild Blueberry, Wild Bilberry, Acai, Black Currant Extract, Sweet Cherry, Raspberry, Elderberry, Blackberry, Aronia, Black Soybean Hull Extract, and Blue Corn), CoffeeBerry®Forte® (high-ORAC powder: 6,000 units/g from Coffee Berry), Curcumin (standardized extract with 95% curcuminoids), Trans-Resveratrol (98% from Giant Knotweed), VitaBerry®Plus® (high-ORAC powder: 12,000 units/g from freeze-dried Grape Seed, Wild Blueberry, Wild Bilberry, Cranberry, Tart Cherry, Prune, Raspberry Seed, Strawberry, Trans-Resveratrol, and Quercetin), VitaVeggie® (high-ORAC powder: 6,000 units/g from Broccoli, Broccoli Sprouts, Tomato, Kale, Carrot, Brussels Sprouts, Onion and Spinach), and Bioperine® (a patented black pepper extract that enhances absorption of all ingredients). By taking Ultimate Protector along with PRO-C™ as my primary antioxidant defense formulas, I maximize my EMF protection by allowing their benefits to function synergistically for greater effect. I emphasize the importance of antioxidant formulas because they are most effective at quenching the free-radicals caused by exposure to electromagnetic fields. In reality, HPDI’s antioxidant and vitamin C formulas are part of a complete system of HPDI supplements. This three-tiered system includes foundational supplements, enhancement formulas, and condition-specific formulas. While antioxidant supplements are most important EMF defense, the truth is that antioxidant supplements work far better when they are properly combined with other foundational supplements in the HPDI system. That is, a high-potency multivitamin, essential fatty acids, and a Rejuvenate!™ superfood. The case for multivitamins is abundantly clear. If you look at the list of harmful effects of EMF (above), you will see that in addition to free-radical damage, EMF harms many essential biological functions in cells. Many of these functions cause cells to require additional vitamins and minerals. These nutrients can be provided by a high-potency multivitamin that provides both optimal amounts (versus minimal amounts) of nutrients, but also proper forms (like coenzyme vitamins) that are most readily assimilated and used by the body. Such forms are immediately used and do not require conversion to usable forms. HPDI Multivitamins include five different formulas, including a children’s chewable that scales up easily for adults. Two of the primary multivitamins are Multi Two Caps and Mighty Multi-Vite (caps). 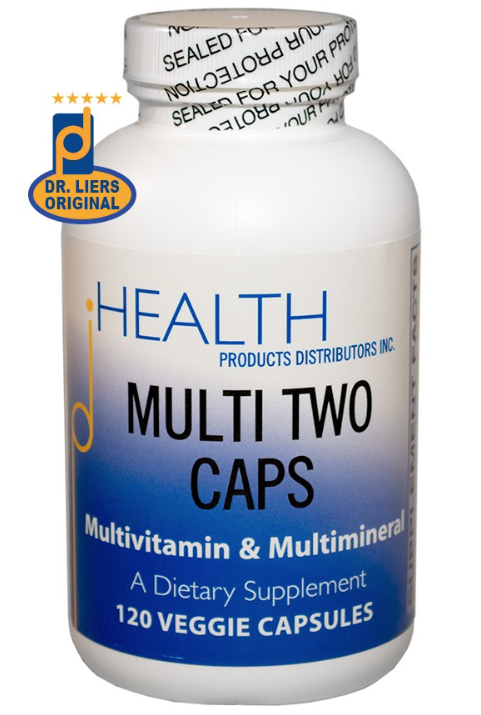 Multi Two Caps – A comprehensive multivitamin providing optimal levels of key vitamins, minerals, and cofactors. Includes higher levels of B vitamins. Mighty-Multi-Vite! – Similar to Multi Two Caps, but offers higher levels of key phytonutrients turmeric, grape extract, and broccoli sprouts powder. • B-Complex vitamins: B-Complex vitamins supports enzyme systems. Enzymes are required for all metabolic functions in the body. B vitamins are cofactors required for every enzymatic reaction. • Minerals. HPDI multivitamins provide 10 or more key minerals. Like B vitamins, minerals support enzyme systems. At the center is every enzyme is an important mineral necessary for its function. • NAC (N-Acetyl-Cysteine): NAC increases glutathione levels, which are important antioxidant defense in the body. • Fat-soluble vitamins A, C, D, E, and K. Fat soluble vitamins perform many essential functions, including protection of cell membranes. COMPLETE, BALANCED CORE NUTRITION. Full-Spectrum of Nutrients Exceptionally Balanced for Supporting Your Health. 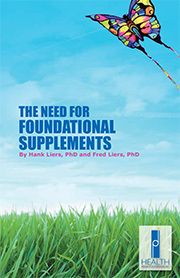 Foundational Formula Ideal for Providing Essential Foundational Nutrition. A high-quality multivitamin is the foundation (i.e., core) for a complete nutritional supplement program. RAPID AND EFFECTIVE ASSIMILATION. Incorporates Bioavailable Vitamin and Mineral Carriers Your Body Recognizes and Can Assimilate Immediately. Plus, Multiple Carriers Ensure Assimilation. Tablet or Capsule Forms Rapidly Assimilated! ENERGIZING: Includes Coenzyme Form Vitamins and Krebs Cycle Bionutrients that work with your body to create high energy levels. Full-Spectrum Essential Nutrients Needed For Building, Supporting, and Maintaining Excellent Health. HIGH PURITY. Among the Purest Available Multivitamin supplements. Carefully Designed To Exclude Common Allergens, and Exclude or Minimize Excipients, Additives, and Fillers. If I could only take a single supplement daily, it would be a multivitamin. I personally prefer HPDI’s Mighty Multi-Vite!. But Multi Two actually provides higher levels of important B vitamins. Multivitamins are too vital not to take daily. Fortunately, you are not limited to taking a single supplement. That is why I put antioxidant and vitamin C formulas at the top of the list for protection against EMF. The truth is, however, that both a multivitamin and antioxidants are essential for foundational nutrition. You need both to ensure optimal protection from EMF. There are a few more critical nutrients you need, as well. Another important foundational supplement is essential fatty acids (EFA). Essential fats are critical for cellular function, cell membrane health, combating inflammatory processes, and overall health. Essential fats are necessary for cellular health. Yet, because EMF creates problems at the cellular level, it is even more vital to obtain essential fats to help cells function at their best. People overlook the importance of essential fats. That is, I notice that multivitamins and antioxidants are far more likely to be prioritized, and therefore taken daily. Fair enough, because I prioritize those supplements too. Yet, we neglect essential fats at our peril. That is why I take EFAs daily, too. When by diet or supplementation, you consume the correct ratios and amounts of essential fatty acids, then you allow the EFAs to act in ways critical for these functions. For more detailed information, see Dr. Hank’s article, “The Truth About Essential Fatty Acids” (December 2017). HPDI’s essential fatty acids formula is Essential Fats Plus E. Essential Fats Plus E provides essential fasts in the proper amounts and ratios for good health. 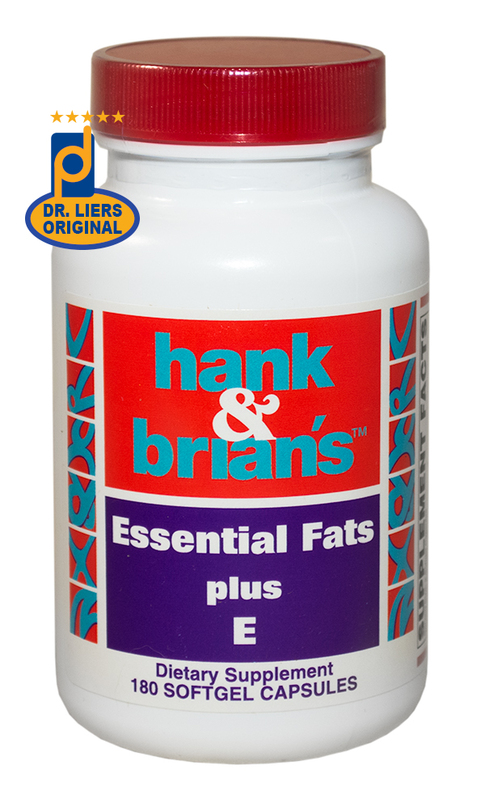 Essential Fats Plus E contains eicosapentaenoic acid (EPA) and docosahexaenoic acid (DHA) (important essential omega-3 fatty acids), gamma linolenic acid (GLA) (an important essential omega-6 fatty acid), and mixed tocotrienols and tocopherols (Vitamin E). The EPA and DHA are in the form of triglycerides derived from marine lipids (using patented flash molecular distillation) and the GLA is from cold-pressed borage seed oil. The mixed tocotrienols and tocopherols derive from rice bran oil, and are included in the softgel capsules for antioxidant protection of the polyunsaturated oils. Omega-3 and omega-6 fatty acids are known to play important roles in the formation of prostaglandins. The prostaglandins are important cellular regulators controlling inflammatory processes and pain in the body. Fish oils may be useful adjuncts in protocols for 1) Cardiovascular disease, 2) Hypertension, 3) Arthritis and inflammatory disorders, 4) Psoriasis and skin problems, 5) Diabetes mellitus, 6) Depression, and 7) Kidney disease. GLA may be a useful adjunct in protocols for 1) Multiple Sclerosis and 2) Arthritis. Research indicates that in a balanced formula there are synergistic effects between EPA, DHA, and GLA. For example, it is known that EPA inhibits the conversion of GLA into pro-inflammatory (and pain-causing) arachidonic acid. Research indicates that in a balanced formula there are synergistic effects between EPA, DHA, and GLA. For example, it is known that EPA inhibits the conversion of GLA into pro-inflammatory (and pain-causing) arachidonic acid. Because these fatty acids have many double bonds that are prone to oxidation, Vitamin E is included in the forms of mixed tocotrienols and tocopherols. In addition, these forms of Vitamin E have been shown to reduce arterial plaques and enhance blood flow, inhibit thromboxane and platelet aggregation, protect serum lipids from oxidation (including LDL and HDL), reduce carotid stenosis (narrowing) and prevent stroke, trap harmful nitrogenous radicals, act as anti-proliferative agents, and provide powerful oxidative defense for the skin. Essential fatty acids are considered “essential” for all the reasons described. They are so critical for proper cellular function that not having sufficient essential fats (or the proper ratios) can impair important processes in the body. I believe EMF exposure puts additional stress on cells such that essential fats are even more necessary. So take an EFA supplement like Essential Fasts Plus E every day. Megahydrate (powder and capsules) provides H-, or the hydrogen anion, which provides lasting antioxidant protection. It this regard, it is highly effective at quenching free radical (even better than molecular hydrogen), greatly enhances the production of ATP (cellular energy) in the body, retains its antioxidant capacity for extended periods, and is the key unlocking the potential of water as the medium for nutrient replenishment and waste removal at the cellular level. 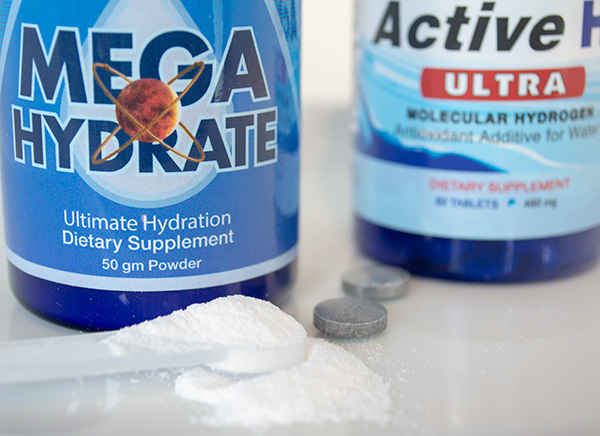 The active ingredient in Megahydrate is silica hydride. One very important characteristic of the antioxidant capacity of silica hydride is that it is the only antioxidant that does not turn into a free radical (i.e., oxidant) once it has neutralized a free radical by donating its electron. Negatively-charged hydrogen turns into molecular hydrogen gas and/or turns into water. One daily dose of Megahydrate has more antioxidant power than hundreds of glasses of fresh vegetable and fruit juices, broccoli, brussel sprouts, leafy greens, and other foods rich in antioxidants and prevents free radical damage. Studies show that Megahydrate increases energy production (adenosine triphosphate or ATP) by up to four times. Neutralizes Harmful Toxins like Fluoride, Chlorine, etc. I drink Megahydrate daily in water. I find it very energizing and it seems to potentiate the other antioxidant supplements. Usually I drink it mixed with Active H2 Ultra, which provides molecular hydrogen. 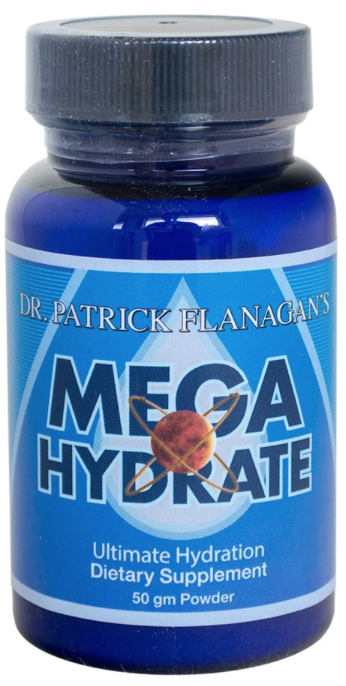 But sometimes I drink Megahydrate all by itself, as it is an excellent standalone hydrogen formula. ACTIVE H2® ULTRA is my favorite molecular hydrogen formula. In fact, I almost always add this tablet into water that is already infused with Megahydrate. That is, I believe this formula works best when taken together with Megahydrate. I like this combination “fizzy” drink so much, I created a video showing how to make it. 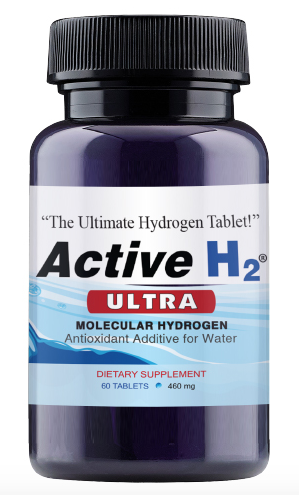 Active H2 Ultra tablets provides abundant hydrogen molecules that are uniquely found in fresh, raw, living foods and are essential to any serious antioxidation program. A unique and patent pending combination of magnesium and supporting nutrients are the only active substances in Active H2 Ultra. This distinguishes it from the existing synthetic chemical formulas as well as the use of electrolysis (as in water ionizers) to generate molecular hydrogen. The natural, proven Active H2 Ultra formula consists of a proprietary blend of pure magnesium metal, malic acid, tartaric acid, stearic acid, and dextrose that act synergistically in water to generate Molecular Hydrogen and electron-rich potential (-ORP). Quickly and cleanly dissolves in less than 1 minute – no waiting around for dissolution. You can drink as soon as the tablet dissolves – thereby getting greater amount of hydrogen than in tablets that take longer to dissolve. Hydrogen is emerging among the top super-nutrition discoveries of the 21st century. I am not waiting to gain its benefits. Just as many athletes are using it to gain a competitive advantage, I take Active H2 Ultra and Megahydrate for their effective antioxidant benefits and much more, including EMF protection. And so should you. RESTORE is one of those products that go beyond anything else I’ve seen in terms of what is can do and how it does it. In fact, I recently published an article devoted solely to Restore (see “Restore Gut Health Formula + Video”). The reason I include RESTORE in my list of top formulas for EMF exposure is because it protects the integrity of the gut barrier or tight junctions, supports the communications system in the gut microbiome, and acts as a fertilizer for the microbiome itself. These are important effects because EMF breaks down tight junctions, interferes with microbiome communications (as gut bacteria use their own weak EMF signals to communicate), and reduces microbiome health. RESTORE is a soil-derived, scientifically backed mineral supplement that creates a firewall against toxins entering the gut wall. RESTORE helps create a biological environment for “good” gut bacteria to grow and flourish in order to support improvement of overall health. RESTORE is not a probiotic. It is not a prebiotic. Rather, it is a carbon rich, alkaline liquid, with lignite derived trace organics and essential trace amino acids, that promotes an optimal environment in the gut. With 70% of the immune system located in the gut, this optimal gut environment leads to great gut health. Research has shown RESTORE to be non-toxic and to support the tight junction cells of the gut lining. 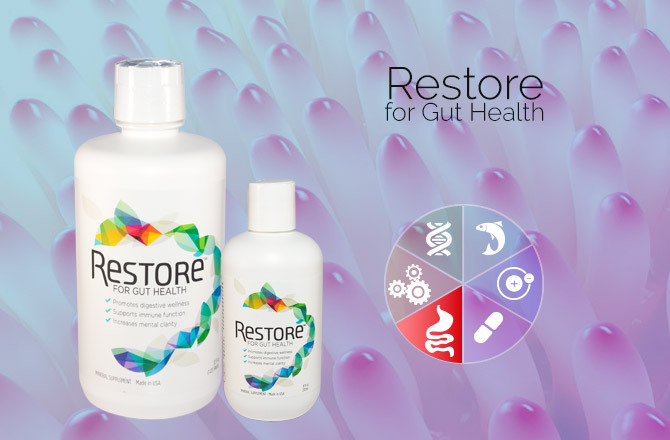 Additionally, RESTORE has been shown both in the laboratory and clinically to help support the functioning of the gut barrier and improve gut health. In experiments, toxins like herbicides and gluten have been shown to degrade the gut barrier. RESTORE has been shown to promote the strengthening of the tight junction gut barrier in small and large gut membrane cells for gut health. One of the main elements in RESTORE is the lignite extract. Lignite comes from decomposed prehistoric matter. As plants decompose, they first form peat, which then turns into humate, then lignite, then leonardite and finally to coal. All of these are rich in carbon. One of the differences between all of these elements is the amount of time and pressure have been applied to them. My list of favorite supplements for EMF could be much longer. I will mention two other types of supplements I think can be useful for most people. One is magnesium and the other is C-60 (or Carbon-60). Magnesium is critical for supporting and enabling at least 400 enzymes in the body that are needed for the vital reactions in cells. EMF can damage or impair enzyme function. Therefore sufficient magnesium is essential for optimal cell function. One known problem is that most people are deficient in magnesium. When enzyme systems lack magnesium, they fail to properly function, resulting in many problems in the body, including lower energy production (ATP) and deficient metabolism. Magnesium also balances calcium in cells. When EMF causes voltage gated calcium channels (VGCC) to open flooding cells with calcium, the presence of magnesium may help because one of the functions of magnesium is preventing cellular calcium imbalances. Not to mention the role of magnesium in energy production—as energy is required to pump excess calcium out of cells. 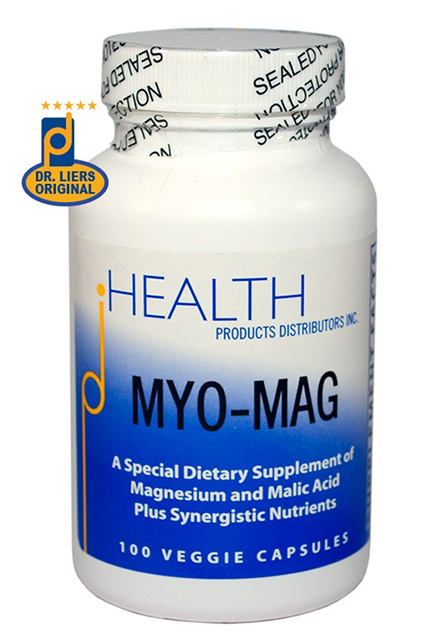 One of my favorite magnesium products is MYO-MAG. MYO-MAG is an advanced, synergistic magnesium formula that provides therapeutic levels of magnesium, plus nutrients that support the body’s utilization of magnesium. 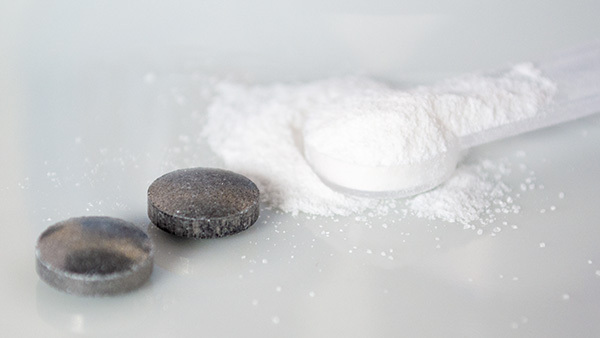 MYO-MAG provides magnesium in the form of malate and diglycinate, as well as Vitamins B1, B2, and B6 (including coenzyme forms of these vitamins). The formula is buffered with a small amount of magnesium carbonate, and includes some manganese for mineral balance. MYO-MAG therefore is a highly effective oral magnesium supplement with benefits that include less fatigue and greater energy, improved metabolic functions, cardiovascular support, nutrition for muscles, reduced spasms or cramps, help for migraine headaches, and many others. The formula not only supports metabolism, but also cellular energy production (ATP) and optimal cellular function. It allows for rapid uptake and absorption of easily assimilated forms of magnesium. It also provides critical nutrients supporting energy production in the body. Because MYO-MAG rapidly boosts magnesium levels, individuals usually notice greater physical and mental energy, reduced fatigue, and often a greater sense of overall well being. MYO-MAG provides magnesium important for cellular energy. MYO-MAG contains ingredients participating in the production of ATP. One vegetarian capsule contains 100 mg of magnesium and 440 mg of l-malic acid. Vitamins B1 and B2 are included both in standard and phosphorylated forms. Also included are Vitamin B6 in its phosphorylated form only, manganese (because high levels of magnesium can deplete the body of it), magnesium carbonate (a malic acid buffer), and glycine as the carrier for a portion of the magnesium and for the manganese. MYO-MAG is contained in a vegetarian capsule to ensure rapid assimilation. Supplementing the diet with magnesium and malic acid may reverse conditions of low energy. Suggested daily amounts include 300-600 mg of magnesium and 1200–2400 mg of malic acid. Taking 3 to 8 MYO-MAG capsules daily can provide these amounts. Beyond this formula, HPDI offers a complete range of magnesium formulas, including Ancient Minerals topical magnesium chloride products (oil, flakes, and gel). Carbon-60 or C-60 is an experimental supplement providing extremely high antioxidant capacities. Carbon-60 provides research grade Carbon-60 Fullerenes (0.8 mg/ml) in organic olive oil. While this formula is formulated for research, it is known to be among the most powerful antioxidants available. The structure of the Fullerene allows for a large number of electrons to be held and repeatedly donated for the purpose of quenching free radicals. It therefore offers unrivaled antioxidant capacity in the body. I will be talking a lot more about Carbon-60 in coming months. Suffice it to say that the research is showing that C-60 may be the future of antioxidant nutrition. Few people have paid much attention to the dangers of EMF until recently. There is growing awareness that EMF contributes to health problems, as well as the mechanisms by which EMF damages the body. Given the rise in health conditions likely to be related to EMF exposure, it makes sense to take action now, rather than unnecessarily risking harmful effects of exposures. There are many actions you take to protect yourself and your family. These include turning off Wi-Fi, putting cell phones on airplane mode, shielding smart meters (or keeping your analog meters), increasing distance from EMF sources, and reducing duration of exposure. Taking nutritional supplements providing good levels of antioxidant nutrients and supporting metabolic functions makes a lot of sense, too. Supplements have helped me be healthier and recover faster from EMF exposures. They likely can help you and yours do the same. EMF damages your cells daily. Take action to protect yourself! Allen, Russ. Electrocution of America: Is Your Utility Company Out to Kill You? Kindle Edition. Glenmore Books, 2008. Bawden-Smith, Jason. In the Dark: New Ways to Avoid the Harmful Effects of Living in a Technologically Connected World. Australia: Major Street Publishing Pty Ltd, 2016. Belyaev, Igor, et al. “EUROPAEN EMF Guideline 2016 for the Prevention, Diagnosis, and Treatment of EMF-Related Problems and Illnesses.” Reviews on Environmental Health, vol. 31, no. 3, 2016, pp. 363-97. Blank, Martin, PhD. Overpowered: What Science Tells Us About the Dangers of Cell Phones and Other Wi-Fi Age Devices. New York: Seven Stories Press, 2015. Burrell, Lloyd. EMF Protection Free Report. eBook. ElectricSense: 2015. Burrell, Lloyd. Long Term EMF Protection: Start Feeling Better Today. eBook. ElectricSense, 2013. Davis, Devra, PhD, MPH. Disconnect: The Truth About Cell Phone Radiation. New York: Environmental Health Trust, 2013. Full Signal: The Hidden Cost of Cell Phones. DVD. Directed by Talal Jabari. Capture Productions, 2009. Gittleman, Ann Louise. Zapped: Why Your Cell Phone Shouldn’t be Your Alarm Clock and 1,268 Ways to Outsmart the Hazards of Electromagnetic Pollution. New York: Harper Collins, 2010. Halpern, Dr. Jonathan, PhD. Electromagnetic Radiation Survival Guide: Step-by-Step Solutions. Kindle Edition. CreateSpace Independent Publishing, 2014. Hardell, L. and C. Sage. “Biological Effects from Electromagnetic Field Exposure and Public Exposure Standards.” Biomedicine & Pharmacotherapy, vol. 62, no. 2, 2008, pp. 104-109. Hardell, Lennart. “World Health Organization, Radiofrequency Radiation and Health – A Hard Nut to Crack (Review).” International Journal of Oncology, vol. 51, no. 2, 2017, pp. 405-413.
International Commission on Non-Ionizing Radiation Protection (ICNIRP). “ICNIRP Guidelines for Limiting Exposure to Time-Varying Electric, Magnetic, and Electromagnetic Fields (Up to 300 GHz).” Health Physics, vol. 74, no. 4, 1998, pp. 494-522. INTERPHONE Study Group. “Brain Tumor Risk in Relation to Mobile Telephone Use: Results of the INTERPHONE International Case-Control Study.” International Journal of Epidemiology, vol. 39, no. 3, 2010, pp. 675-94. Johnson, Jeromy. Wireless Wake-Up Call. TEDxBerkeley. 2016. Kundi, M., L. Hardell, C. Sage, and E. Sobel. “Electromagnetic Fields and the Precautionary Principle.” Environmental Health Perspectives, vol. 117, no. 11, 2009, pp. A484-5. Michigan State University. “Electromagnetic Fields Affect Human Cells.” ScienceDaily. ScienceDaily, 16 October 2000. Web. Feb. 2018. Mild, K.H., M. Repacholi, E. Deventer, and P. Ravazzani, eds. International Workshop on EMF Hypersensitivity Conference Proceedings: Electromagnetic Hypersensitivity, 25-27 Oct. 2004, Prague, Czech Republic. Geneva, Switzerland: World Health Organization Press, 2006. Milham, Samuel, MD, MPH. Dirty Electricity: Electrification and the Diseases of Civilization. Second Edition. Bloomington, Indiana: iUniverse, 2012. Mobilize: A Film About Cell Phone Radiation. DVD. Directed by Kevin Kunze, performances by Gavin Newsom and Steve Wozniak. Dreamscape Media, 2016. Ober, Clinton, Steven T. Sinatra, and Martin Zucker. Earthing: The Most Important Health Discovery Ever. Colorado Springs, CO: Basic Health Publications, 2014. Phillips, J.L., N. P. Singh, and H. Lai. “Electromagnetic Fields and DNA Damage.” Pathophysiology, vol. 16, nos. 2-3, 2009, pp. 79-88. Pineault, Nicolas. The Non-Tinfoil Guide to EMFs: How to Fix Our Stupid Use of Technology. Montreal, Canada: N&G Media, Inc., 2017. Pinsky, Mark. The EMF Book: What You Should Know About Electromagnetic Fields, Electromagnetic Radiation, and Your Health. New York: Warner Books Incorporated, 1995. Plourde, Elizabeth PhD and Marcus Plourde PhD. EMF Freedom: Solutions for the 21st Century Pollution. 3rd Ed. Irvine, California: New Voice Publications, 2016. Resonance: Beings of Frequency. DVD. Directed by James Russell. Jansen Media, 2016. Simkó, M., and MO Mattisson. “Extremely Low Frequency Electromagnetic Fields as Effectors of Cellular Responses in Vitro: Possible Immune Cell Activation.” Journal of Cell Biochemistry, vol. 93, no. 1, 2004, pp. 83-92. Starkey, S.J. “Inaccurate Official Assessment of Radiofrequency Safety by the Advisory Group on Non-Ionising Radiation.” Reviews on Environmental Health, vol. 31, no. 1, 2016, pp. 493-503. Take Back Your Power: Investigating the Smart Grid. DVD. Directed by Josh del Sol. BigPitcher Films (Canada), 2013. Waugh, Jim. Living Safely with Electromagnetic Radiation: A Complete Guide for Protecting Your Health. Richmond Hill, Canada: Firefly Books, 2010. I love hydrogen supplements. So should you. Since starting my morning—and often afternoon—routine of making hydrogen drinks in the kitchen, I have come to appreciate the surge of energy lasting many hours, as well as a host of other benefits. Most of all, I am amazed how easy hydrogen supplements are to use considering how much they do for you, and how well they complement the supplements I already take—seeming to make them all more effective. I typically use one or two effervescing Active H2 Ultra tablets in 8–16 ounces of water. Then I like to open one Megahydrate capsule directly in the effervescing water. I wait about 90 seconds to let the tablets stop “fizzing” and then I drink immediately. Allowing the drink to sit for a few minutes is okay, but the sooner you drink it, the higher the concentration of hydrogen. Note: I used Vital Reaction tablets in this video, but my preferred product is the new, improved Active H2 Ultra (tablets) which dissolves in less than one minute—faster than other hydrogen tablet formulas—thereby preserving more hydrogen in the water. Hydrogen supplements are among the newer, cutting-edge nutritional formulas available to support optimal health. More than 500 scientific articles now support the therapeutic potential hydrogen for essentially every organ system and in 150 human disease models, according to the non-profit Molecular Hydrogen Foundation. In fact, hydrogen is rapidly incorporated into medicine, sports medicine, peak performance, elite fitness, and more. H2 reduces oxidative stress as a selective antioxidant and by maintaining homeostatic levels of glutathione, superoxide dismutase, catalase, etc. H2, like other gaseous signaling molecules (i.e. NO, CO, H2S), appears to have cell signal-modulating activity affording it with anti-inflammatory, anti-obesity, and anti-allergy benefits. According to the Molecular Hydrogen Foundation, there are three ways molecular hydrogen exerts positive health effects. 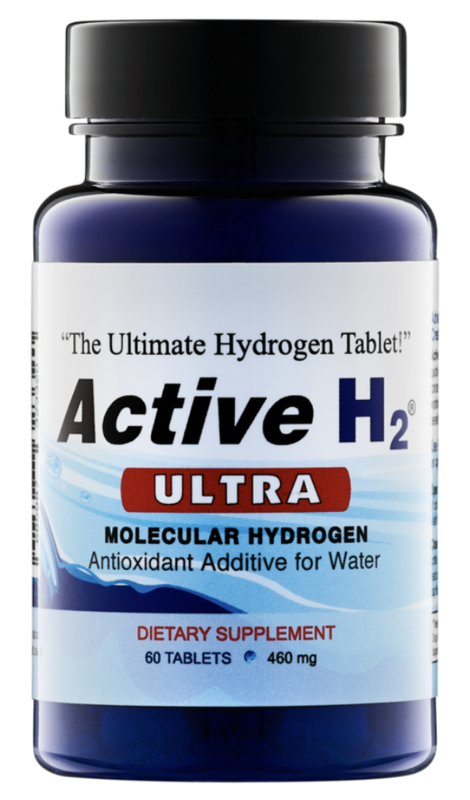 Active H2 Ultra hydrogen supplement (60 tablets). 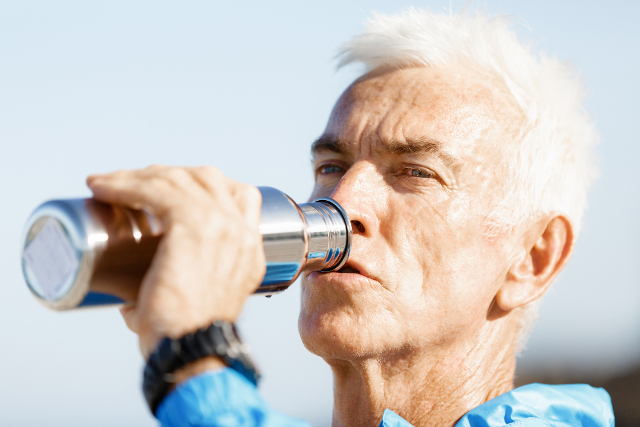 Molecular hydrogen exhibits great safety, and it is regarded as safe for use in the body. It is shown no toxicity even in high concentrations. Safety standards have long been established for high concentrations of hydrogen for inhalation largely because of the history of high-pressure H2 gas used in deep-water diving gas mixtures for preventing decompression sickness. Notably, H2 gas combusts only at temperatures higher than 527 °C, and it explodes by chain reaction with oxygen (O2) only in the range of H2 concentration (4–75%, vol/vol). Molecular hydrogen is used for medical applications safely by several ingestion methods including inhalation of 1–4% hydrogen gas, for example, which exhibits great effectiveness. All these factors mean that hydrogen is safe, easy-to-use, and effective for therapeutic purposes. According to the Molecular Hydrogen Foundation, drinking H2-rich water is the easiest, and often the most effective, method for obtaining hydrogen. Drinking hydrogen-infused water is easy to do, and convenient as you can drink it at home or while traveling. 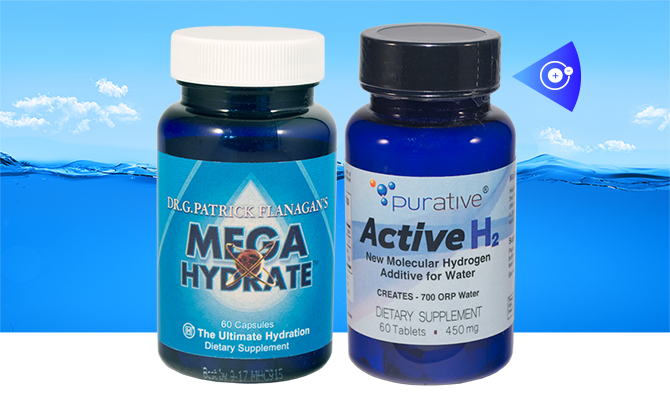 Effective hydrogen products HPDI carries include Active H2 tablets and Megahydrate capsules. As noted, I make one or two hydrogen drinks daily, first in the morning and then often again in the afternoon. I drink them on an empty stomach. I enjoy a significant energy boost, which helps power me through my day. I gain other benefits, including improved athletic performance, noticeably faster recovery from exercise, and an overall greater sense of well-being. I highly recommend you try hydrogen supplements for yourself, and then consider them for your clients or patients. Our experience is that most people are pleasantly surprised by the results they get from hydrogen supplements, especially if they have a need for exceptional free-radical defense, or stand to benefit from the proven effects hydrogen uniquely provides (see list above). Once you try hydrogen, you will want to continue taking it because the benefits are so significant. Let the power of hydrogen starting working for you on a daily basis! 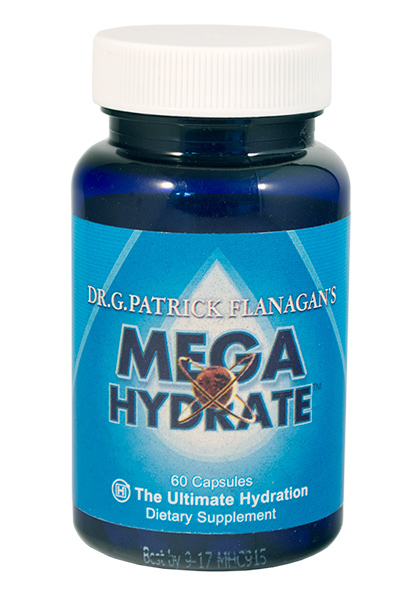 Dr. G. Patrick Flanagan’s Megahydrate (60 capsules). Hydrogen supplements like Megahydrate and Active H2 are foundational in the HPDI supplement system.